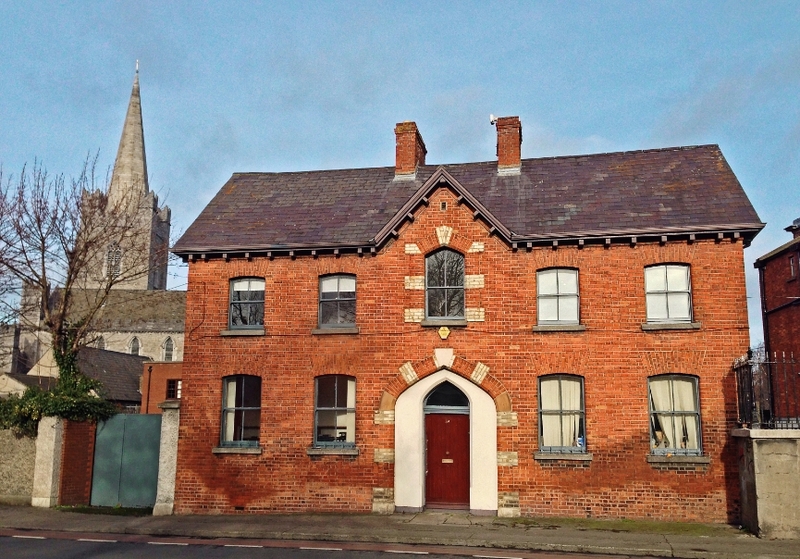 Founded in 1432, St. Patrick’s Cathedral Choir School is the oldest existing school in Ireland. While the Cathedral’s grammar school is likely to be older, it is in its recent form dated to a mere 1547. The choir school was founded when Richard Talbot was Archbishop of Dublin (1418-1449), owing to the need for a steady supply of young choristers for the cathedral. Six minor canons and six choristers were part of the new “college” and the six boys would have been charged with singing the plainsong of the daily Lady mass. Minor canons received 10 marks and choristers 4 marks per annum for their efforts. The original location of the school was probably to the west of the present Deanery. In 1546, it was described as having a hall, kitchen, and sixteen bed-chambers. During the Reformation, Edward VI closed the choral school and converted it to a grammar school. However by 1615, the choir school was restored. While writing about all of this in 1820, William Monck Mason says that the ruins of the ancient school were still visible at that time. Glory be to Monck Mason, who provides us with a contemporary map showing the arrangement in the early nineteenth century. The Vicar’s Choral Ground is visible bordering Kevin St. The choir school likely had a close connection with Christ Church Cathedral as well at various points in its history. It is noted that following the Restoration of the Monarchy in 1660 (the interregnum being the second of two times the school closed in its history) Richard Hosier held the position of “master of the song and tutor of the boys” at both institutions. Hosier’s successor Nicholas Sanderson got into trouble for his teaching methods. He was admonished for teaching the boys to “sing not by art but by rote” (Boydell). Arrangements for those attending the “song school” were quite formal. Choristers were apprenticed to a master of song, who trained them and housed them with his family. In return he received allowance for laundry and haircuts! In more recent centuries, choristers also attended the Grammar School. The report on endowed schools in 1856—not one to hold back criticism— stated that “this is a good school”. After the disestablishment of the Church of Ireland in 1869, the cathedral was no longer required to support the school. Support up to this point involved master’s salary, accommodation, etc. In the nineteenth century, it was more common to use schoolmasters who ran schools in the locality, as the accommodation had deteriorated so much that it would have been difficult to attract a resident master; the salary not being the most generous. While there was no onus to support a school, there was a need for choristers, and the Dean (Dean West) built a new Choir School at 39 Kevin St in 1870. We can see from Monck Mason’s map above that this building was built on a plot marked as “Dean’s Ground”. Originally an alley ran along the west; noted as Mitre Alley on Monck Mason’s map (and indeed as Myter Alley on Rocque’s 1756 map), but later named Chapter Close by OSi. An alley of sorts still exists—it is now part of the school yard with the gateway to the left of the house shown terminating the south end. “The singing of this choir is admirable in every respect, and is marked by refinement and finish”. Unfortunately the report for the standards in other subjects were not as ebullient. The school buildings were in a poor state and decayed over the course of the twentieth century. The choir school became part of the National School system in 1974, and in 1981, a new building with musical facilities were completed. Later the Grammar School also acquired new buildings, opened by Charles Haughey in 1988. 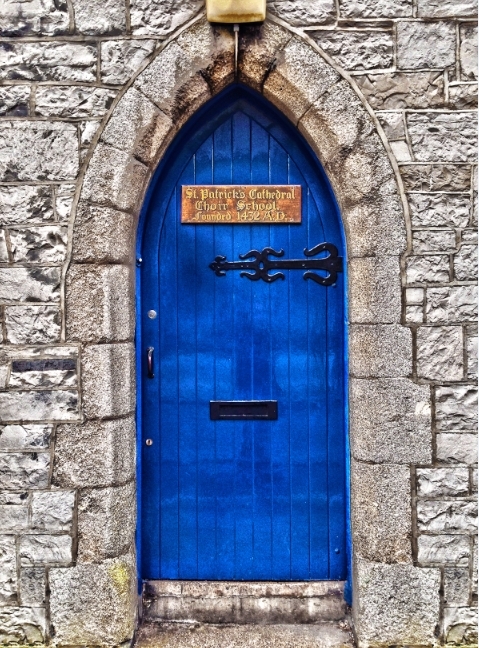 These brick buildings bookend a handsome, much older, building, with a fairy-tale blue door. Behind it, is nearly six centuries of history. More posts on Kevin St are listed in the Table of Contents. You can receive email updates when a new post is published by subscribing below. Barra Boydell (2004) A History of Music at Christ Church Cathedral, Dublin, Boydell Press. Rex Cathcart (1994) In the Shadow of St. Patrick’s, Dublin Historical Record, 47(1), 71-76. If there is another street in Dublin that doffs its cap to as much history in five hundred paces as Kevin St does, I’d like to walk it. I can’t quite say why, but I think it is a peculiar street. Perhaps it is the awkward meeting of its Upper and Lower sections; once linked by the street Cross Kevin St., but now joined together by a serpentine junction. Or perhaps it is the lack of much street-level function; there is but a few number of shops on the street. Instead it is punctuated with large buildings which make it a street to go to, rather than to be on. But Kevin St is one of Dublin’s oldest streets, and deserves our attention. It is recorded on Speed’s 1610 map and its name—derived from the ancient church of the eponymous saint now accessed off Camden Row—hasn’t changed over those four centuries. That’s quite a feat. Even if the name hasn’t changed, Gabriel Beranger’s gorgeous drawing of St Sepulchre’s Palace from around 1770, now the site of Kevin St Garda station shows how much the street has changed over the last two centuries. The palace is also marked on Speed’s map, although it was much older than 1610. It dates from the twelfth century, after the Synod of Kells increased the number of Archbishops in Ireland from two to four: Tuam and Dublin getting the loot. Bishop Gregory of Dublin subsequently became Archbishop Gregory, and the palace was built sometime over the next century. The church’s 74,000 acres of lands in county Dublin included the Manor of St Sepulchre, which consisted of the parishes now known as Crumlin, Donnybrook, SS Catherine. Nicholas and Peter, and Taney. The poor archbishop was bounced in and out of the palace over the centuries. Edward VI, Henry VIII’s son, dissolved St Patrick’s Cathedral and moved the Lord Lieutenant (“the Deputy of our Realm”) into the palace, with the Archbishop moving to the Deanery. Edward’s sister Mary moved the bishop back in, but then the Earl of Sussex (Elizabeth’s Lord Deputy) moved him back out again, but this, again, appears to be short lived, for in Archbishop Adam Loftus’ time there at the end of the sixteenth century, it was described as “a semi-regal abode well pleasantlie sited as gorgeously builded“. St Sepulchre’s Library, originally part of the complex, obviously still exists— it is now known as Marsh’s Library. While the palace technically still exists, there isn’t much in Kevin St to relate back to the original structure, some interior detail aside. The unusually large gate-posts into the Barracks have been dated to about 1720. The entire site is now a bit of a mess. During the boom, plans were well advanced for a new Garda station at the intersection of Kevin St Upper and Lower. Those plans came to a halt very abruptly, and all that remains of that is a large hole in the ground. Even the sign proclaiming the building that was meant to be has disappeared. The OSi 25″ map from the late nineteenth century shows both the size of the original complex, and I think, how much more lively the street was at that time—the number of houses both on Kevin St Upper and Bride St (now site of Large Hole) is substantial – a glimpse of those houses on Bride St is available at the photo on this Come Here to Me! article. The lane running between the barracks and the Deanery to the west was originally called Patrick’s Close, although the connection between the two ends looks like it would only fit a pedestrian in the earlier OSi map from ca. 1840. It has regained the name Patrick’s Close, but it is clear on the map shown that it was for some time known as Guinness Street. This is likely due to the substantial amount of money provided by Edward Cecil Guinness for the restoration of St Patrick’s in the nineteenth century. It’s hard to avoid his name when reviewing the Cathedral’s excellent history timeline on their website. Just opposite the entrance to Guinness Street, we can get a glimpse of what the house on the corner looked like from Flora H Mitchell’s pretty watercolour “Marsh’s Library from Cathedral Lane.” It shows a three storey building with a shop on the ground floor. This is number 15, which in 1911 was home to Michael Doyle, a “coal factor”, and his family. 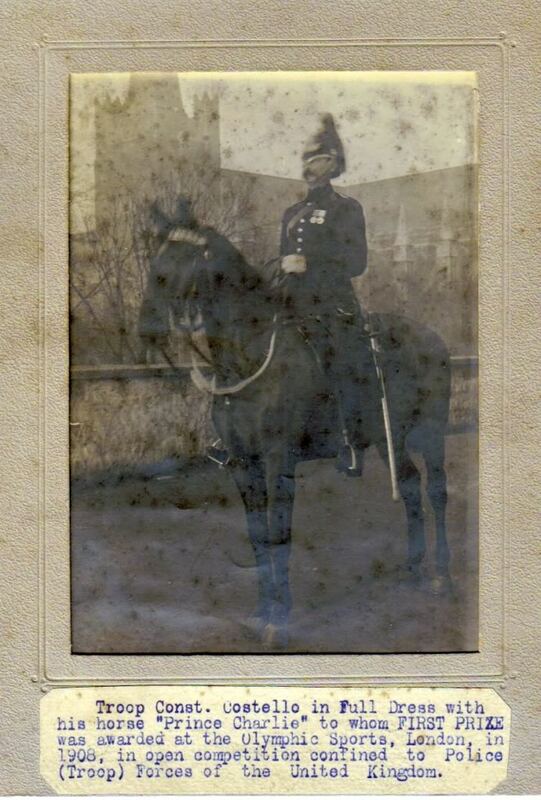 Back on the mid-nineteenth century, it was home to George Close and Sons, Saddlers and Harness Makers; perhaps more fitting given that the Mounted Police were in the Barracks across the road. More to come on Kevin St! Victor Jackson (1975) The Palace of St. Sepulchre, Dublin Historical Record, 28(3), 82-92.